AUTOMOBILE thieves are thwarted by a new steering wheel lock which has been invented in England. This lock fits the steering column in the conventional manner, as shown in the photo. 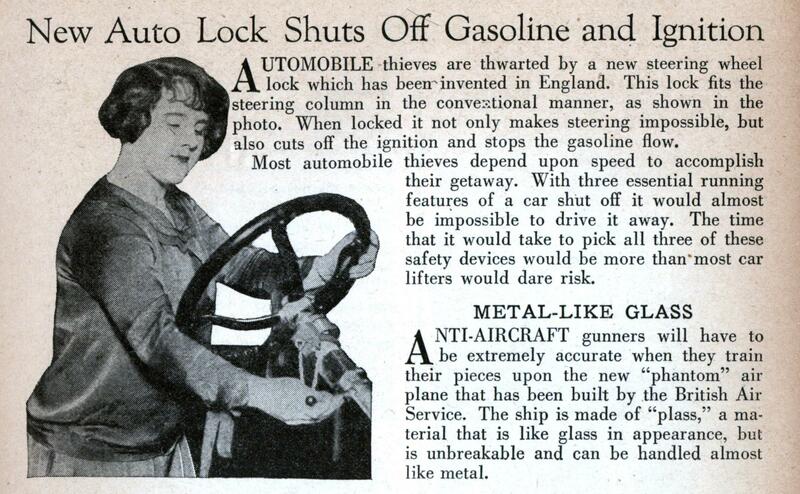 When locked it not only makes steering impossible, but also cuts off the ignition and stops the gasoline flow. Most automobile thieves depend upon speed to accomplish their getaway. With three essential running features of a car shut off it would almost be impossible to drive it away. The time that it would take to pick all three of these safety devices would be more than most car lifters would dare risk. Do you suppose Wonder Woman’s invisible plane was made out of plass? Plass is what they called it before “transparent aluminum”. 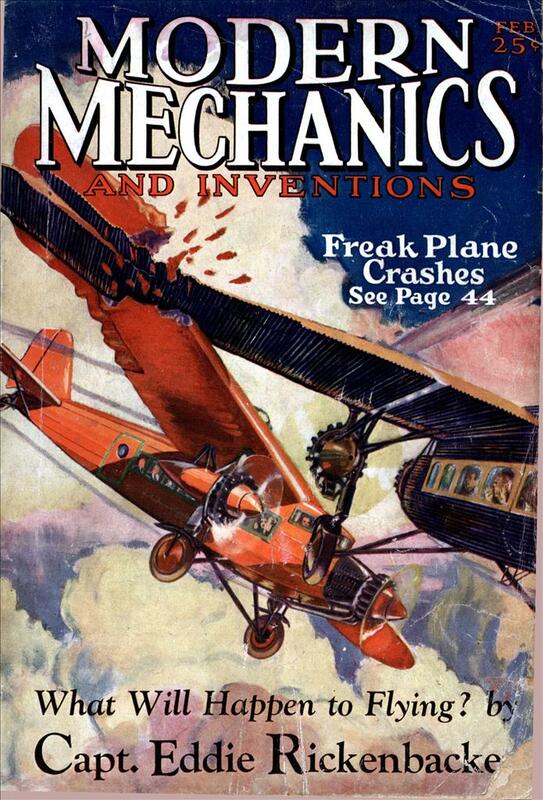 I read that around (or possibly during) WWI the Germans tried covering an airplane with celluloid sheets instead of the usual doped fabric. The covering was transparent, but reflected sunlight so well from the slab-sided fuselage that the plane was actually visible from a greater distance than if just fabric-covered. Randy: Perfect!! I always enjoy learning something that I didn’t know before and this type of construction was a complete surprise. Thanks. You’re welcome (I knew my memory could not be too far off :)), and thanks in turn for the cool book PDF. I’m trying to find a specific pre-WWII book on seaplane construction. The San Francisco main library had a copy in its stacks before the ’89 earthquake, but not afterwards. Hopefully a copy has been digitized. Randy: If it’s Seaplane Design by Nelson in 1934 I haven’t found any digital copies.